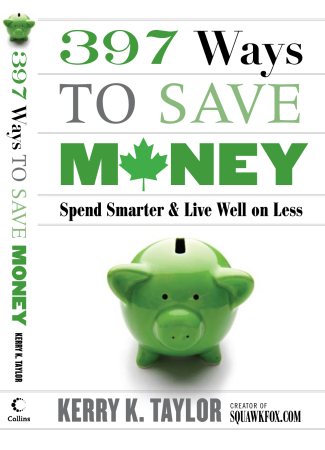 Crock pots (or slow cookers) are amazing tools for cutting grocery costs and feeding a family for less. After getting a new slow cooker last year, I’ve been amazed with the delicious, easy, healthy, and cheap family meals I’ve prepared in zero time with few cooking skills. I wrote a little post singing the praises of my favorite kitchen tool in 6 reasons to use a slow cooker – in case you need convincing. Since cooking slow is a delicious way to prepare vegetarian meals, I’ve gone super veggie by including FOUR vegetarian recipes for your dining pleasure. If you’d prefer chicken or beef, then try these recipes for Pot Roast and Southwestern Chicken Soup. Now, on to the veggie goodness! 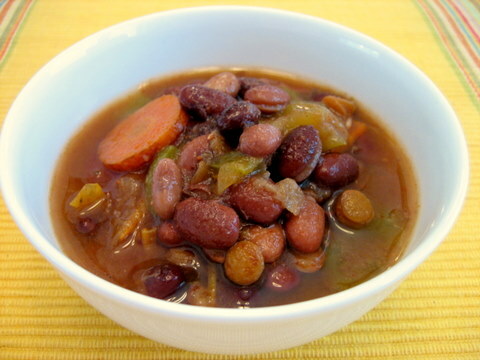 I love this healthy, cheap, and easy stew that’s ready to serve when I get home from work. This Mediterranean stew slow cooker recipe is rich with flavor, bursting with color, and it won’t leave your wallet hungry. Add some cooked brown rice or serve with quinoa for a change in taste. Yum! 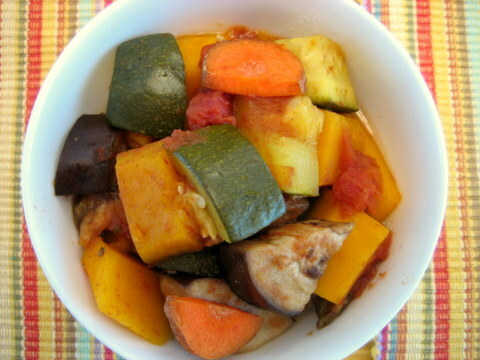 In a 6-quart slow cooker, combine eggplant, butternut squash, zucchini, green peas, canned tomatoes, onion, carrot, broth, raisins, and garlic. Add and stir cumin, turmeric, red chilies, and paprika. Cover, and cook on LOW for 8 to 10 hours or on HIGH for 4 to 5 hours (or until vegetables are tender). TIP: Don’t want mushy zucchini? Then add your zucchini in the last 30 minutes of cooking. You won’t miss the meat in this crock pot chili recipe – promise! When I make this chili recipe I like to use a 6 qt slow cooker to make extra and then freeze for family meals later in the month. Now let’s get down to bean-iness! 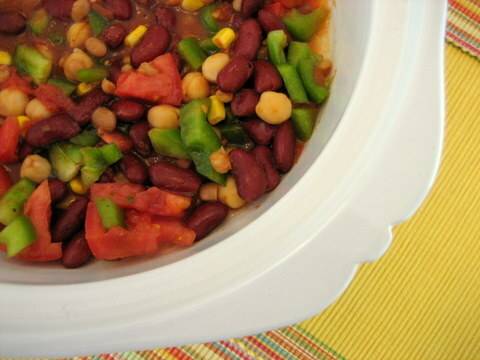 In a 6-quart slow cooker, combine kidney beans, chick peas, tomatoes, baked beans, onion, corn, green pepper, and celery. Add and stir chili powder, garlic, basil, oregano, and parsley. Cover and cook on LOW for 6 hours or on HIGH for 4 hours (or until vegetables are tender). 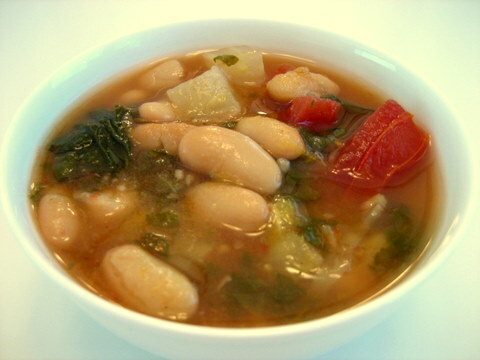 This crock pot recipe for white bean and fennel soup has been a favorite of mine for decades. There’s just something soothing about slow cooked fennel broth and juicy white kidney beans. If I’m feeling fun I’ll use the tomatoes I froze from my organic garden. The recipe pictured uses yellow and red beefsteak tomatoes from last fall’s tomato harvest. 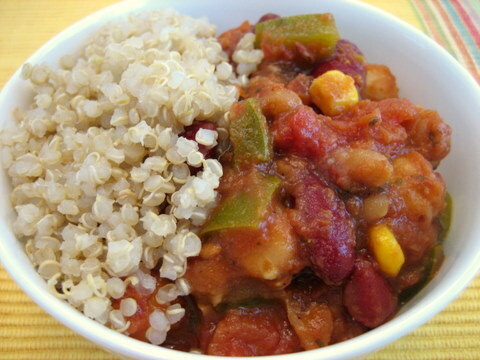 Mix in some cooked quinoa or rice to extend this healthy family meal. 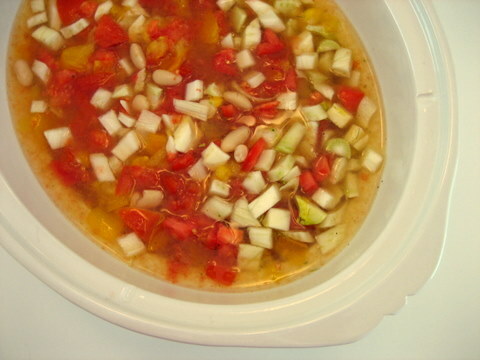 In a 6-quart slow cooker, combine vegetable broth, tomatoes, fennel, beans, onion, black pepper, and garlic. Cover and cook on LOW for 6 to 7 hours, or HIGH for 3 to 3.5 hours. Add thawed spinach. Cover and cook for 1 hour on HIGH or 2 hours on LOW. This is a super simple black bean soup recipe for your family to try. Feel free to add more or less spice for your taste. Whenever I make recipes calling for beans I opt to soak and cook dried beans – but use canned beans if you’re short on time! 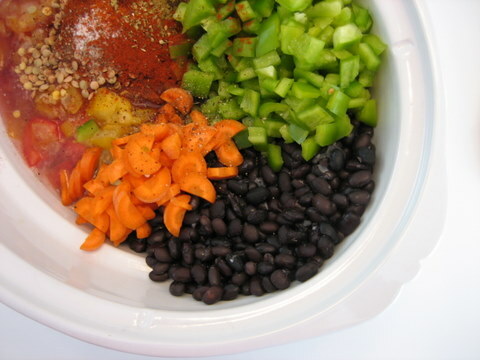 In a 6-quart slow cooker, combine canned or cooked black beans, carrot, celery, onion, green peppers, jalapeno pepper, lentils, and tomatoes. Add and stir chili powder, salt, black pepper, cumin, garlic, and oregano. Cover and cook on LOW for 8 hours or HIGH for 4 hours. Stir the quinoa OR rice into the crock pot in the last 30 minutes of cooking. Blend or puree around 1/3 of the soup with a food processor or hand blender, then return to the pot before serving. 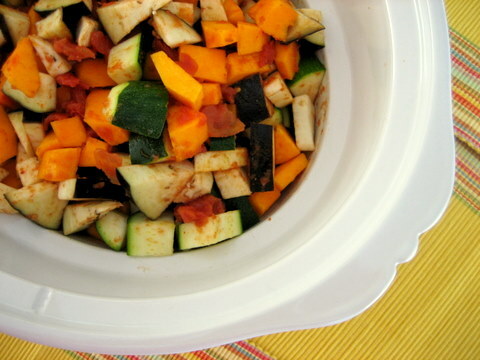 Do you love your slow cooker for vegetarian cooking? Got a favorite recipe? Share away! MMMMM, the white bean soup looks especially delicious. 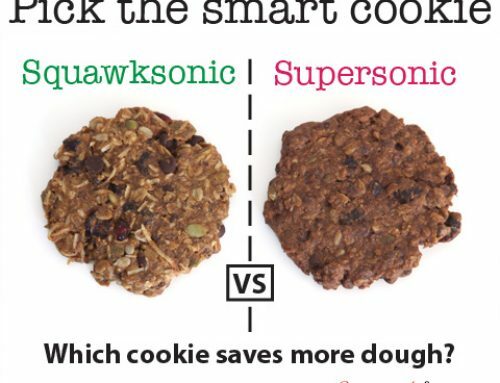 those are some really great veg alternatives from the ones you posted last week. This are healthier options that are easy on the stomach. Now I need to decide which one to try first! lol. Thank you, I was thinking this weekend about a slow cooker, after seeing one on sale at Zellers, but I didn’t know of any good recipes. Sorry one last comment. 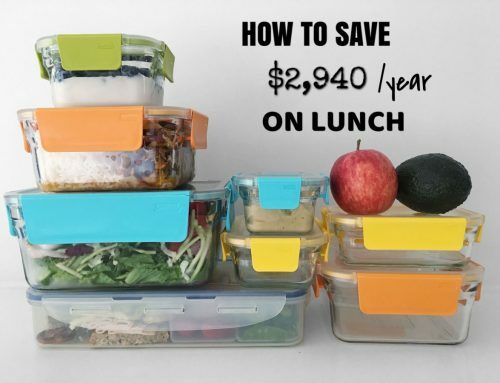 I am usually out of the house for 11 hours a day (when you figure in travel), some of these recipes are 6 hour on low or 8 hour on low. What would happen if they get left in their earlier? Any other option for those of us who work longer than 8 hours? @Joni I’m thrilled you enjoy my attempts at photography. I admit I try really hard to get you guys some decent shots to enjoy. @DavidV You ask awesome questions. When shopping for a slow cooker consider getting one with a removable crock and a timer. When you are away for 11-hours I’d suggest making only veggie meals and setting your crock (with timer) to start 2 hours into your day. To delay start a meat dish is probably not safe due to bacterial issues. 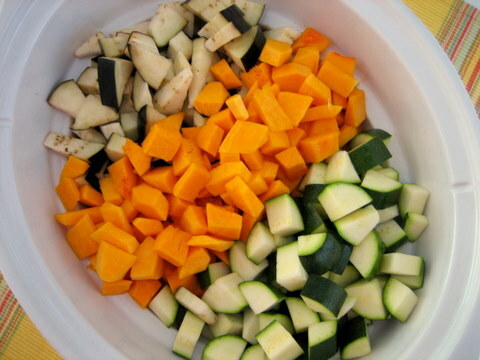 Another alternative is to slow cook a recipe with more root veggies or to chop your veggies thicker. 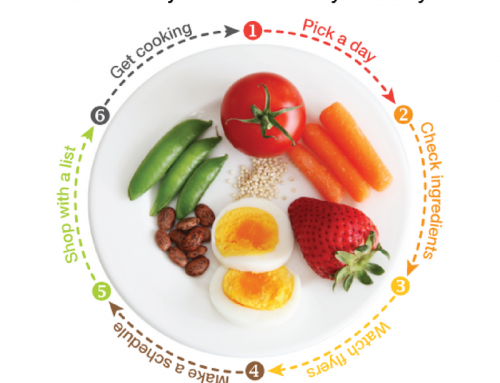 Thicker cut veggies take longer to cook. Hope this helps! Ooh tasty, thanks for these great ideas! I don’t make use of my slow cooker as much as I ought to. Oh yum! 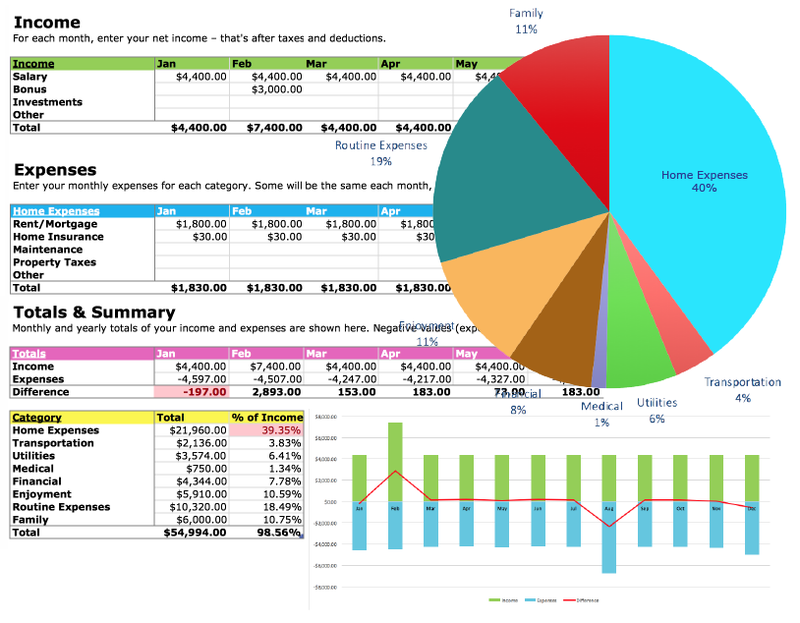 I’ve been thinking of buying us a slow cooker for quite a while, but I was a little apprehensive of spending so much (what’s it say about our finances when 30 euros is “a big purchase”? * 🙂 ) for something that might not get used. Your recipes have definitely added a new dimension to the utility of a slow cooker, and we’ll definitely get one soon! I’ve been making lots of these types of meals – great, hearty veggie stews and soups are the way to go. And unfortunately, the weather here is still cold and snowy so warm comfort soup is still well suited to the weather. Jules – definitely consider buying a used one! That should save you some money. I buy most of my kitchen equipment used. It’s easy to find! I’m trying to cut my meat intake down so a tasty veggie stew is perfect! I just stumbled across your site. Love it! We eat so very little meat in our house, so it’s wonderful to find a site with some delicious veg soup/stew recipes. Thank you. Since becoming vegetarian over a year ago I haven’t had much opportunity to drag out the old crock pot. Thanks so much for these recipes! I am thrilled to have found your web site. found it when looking for dehydrated granola bar recipe. I love cooked beans and I am learning to cook them so they are really tasty. It is an art, so thank you for your tips. Can you please tell me, what the white things are on the side of the crock pot chilli recipe. IT looks like something sprouted and delicious…. 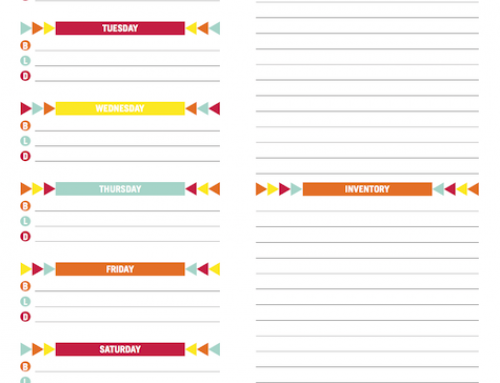 I have one request though, can you make a tab at the top of the page for recipes? It would make it much easier to access them. At present i dont know where to look apart from doing a google ..
@DavidV – I also generally work longer than 8 hours and something I’ve done with veg recipes (though I think it would also be safe with meat recipes) is to prep everything the night before, put it in the insert and put the insert in the fridge. Since you’ll be starting out with your pan and ingredients cold, it will take a bit longer (maybe 1-2 hours?) and since it is cold to start out with, I think it may be safe to do with meat. These are great recipes. I belong to a grain CSA and have MANY pounds of wheat berries and barley. Do you have crock pot recipes for them? Does anybody know what size cans of diced tomatoes for these recipes? I want to try cooking these, they look yummy! Wow. 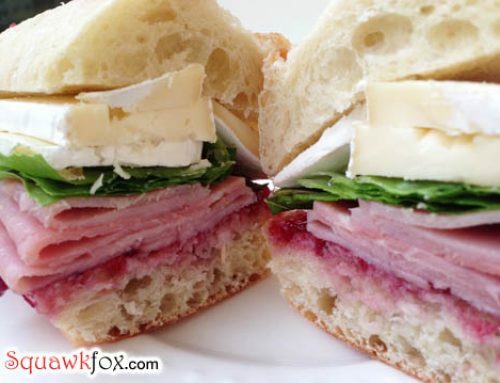 I love these recipes no more boring vegetarian dishes for me now I have found your site. Slow cooking suits my lifestyle and I think I could even tempt my husband with the Mediteranean stew. 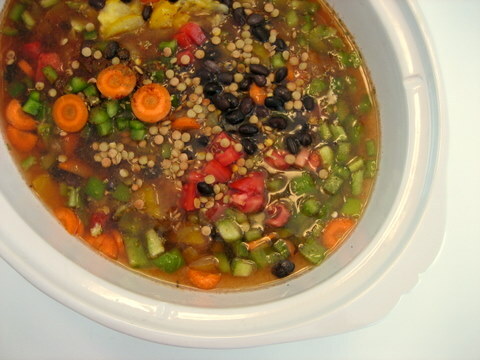 I have only recently started reading your blog and am loving all the slow cooker ideas. It’s fall here and that always makes me want to start to cook and freeze for winter, especially now with a new baby! We are trying to cut back on the red meat for our health and wallet’s sakes, so I can’t wait to try out some new bean and vegetarian recipes. I just wish I was at home this week to get started instead of away for work! 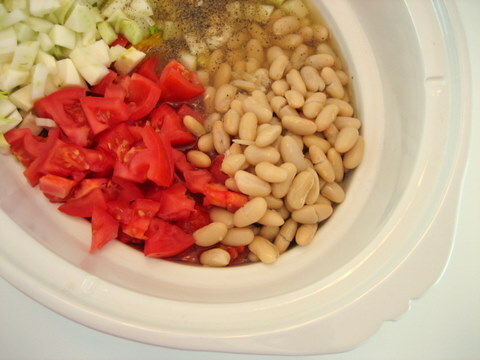 Novice cook here…What size cans of diced tomatoes (& white kidney beans) do you use for your Slow Cooker White Bean & Fennel Soup: 398 ml or 796 ml (28 fl oz) each? Is there no broth in the black bean recipe? I made it today and it turned out like a bean dip. A tasty bean dip, for sure, but for the life of me I can’t figure out where I went wrong. Thanks!